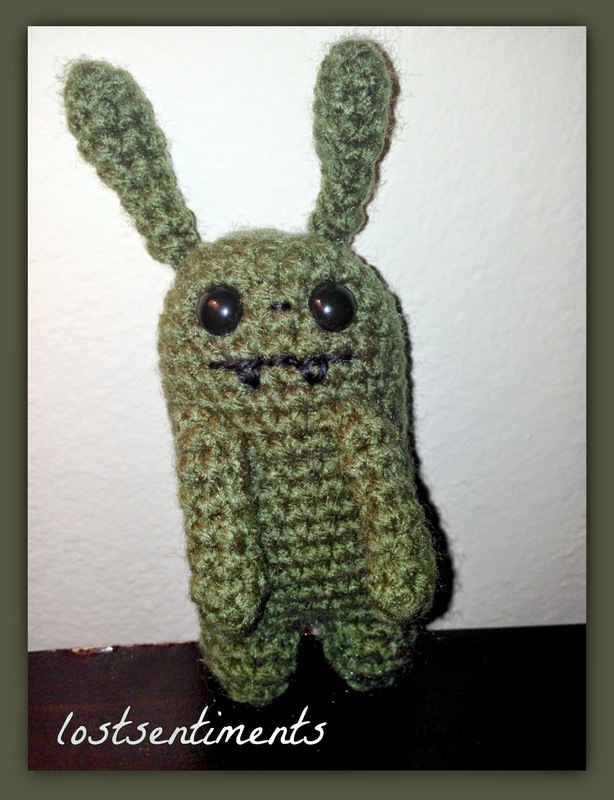 Finished zombie bunny will average 5 inches tall from feet to tip of ears and 1 3/4 inches wide. Find the stitch in middle of the front, count 10 stitches back and mark this stitch. Row 21: Sc 13, Chain 2, Sc in marked stitch on the back side of rabbit, move marker here. Row 2: Dec around until only 5 stitches remain, then weave in ends over last 5 and sew up bottom of the leg. Row 3: Dec around until only 5 stitches remain, then weave in ends over last 5 and sew up bottom of the leg. With a length of thread sew up the bottom of the body, there should be 4 stitches on each side. Sew the ears directly above each eye 3 – 4 stitches apart. Sew the arms on between Rows 9 – 10, 4 stitches apart. Sew the mouth between rows 7 & 8 across 5 – 6 stitches. Sew the nose in between the eyes, centered. This pattern is Copyright to Lostsentiments. All rights reserved. You have permission to sell the finished item from this pattern but rewriting, reselling, distributing or copying the pattern itself is prohibited. Please include a link back to my etsy shop or blog in all sales/listings of items. When friends bring me a cartoon or drawing to bring to life and the height they want, I have to sketch it to be sure I get the doll to scale. Above is the sketch I made to use as a guide :). I recommend anyone who can draw and crochet to use this method. Granted you'll be working the doll up and pulling out the stitches from time to time, but hopefully it will spare some of your time! If you would like to see the German translation of this pattern you can do so HERE. Please show her blog some love as well! Thank you for such a cute little pattern. I have been searching for small crochet toys for my new baby granddaughers, this would be perfect for their little hands. Konig - I'm glad to hear you made this little guy a reality in your world! :D Thank you for asking about the translation! 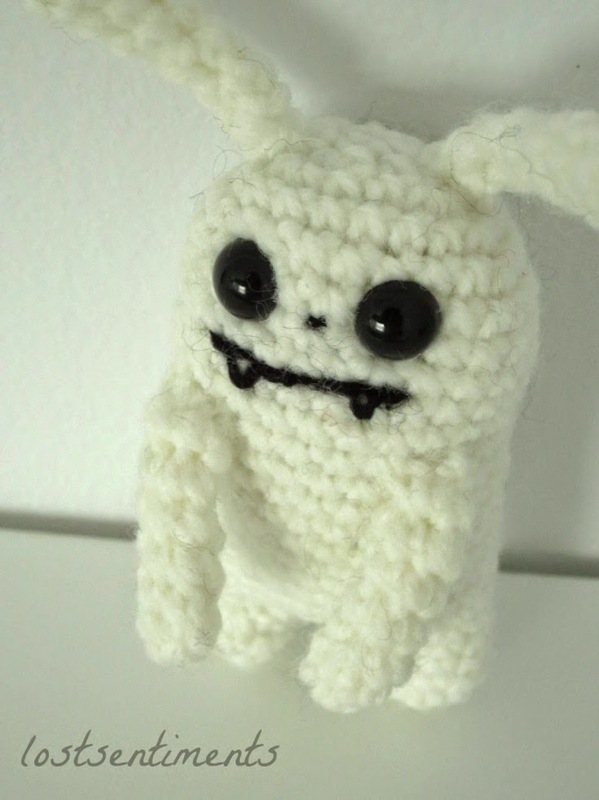 Please feel free to share the pattern translated into German so others can make the Killer Rabbit ;). I give you written permission to share it on your blog in German with the copyright and a link back to this page. Go wild Kerstin! And please stop back here often! ;) I'm always up to something! Thank you thank you! Thank you Kersten! 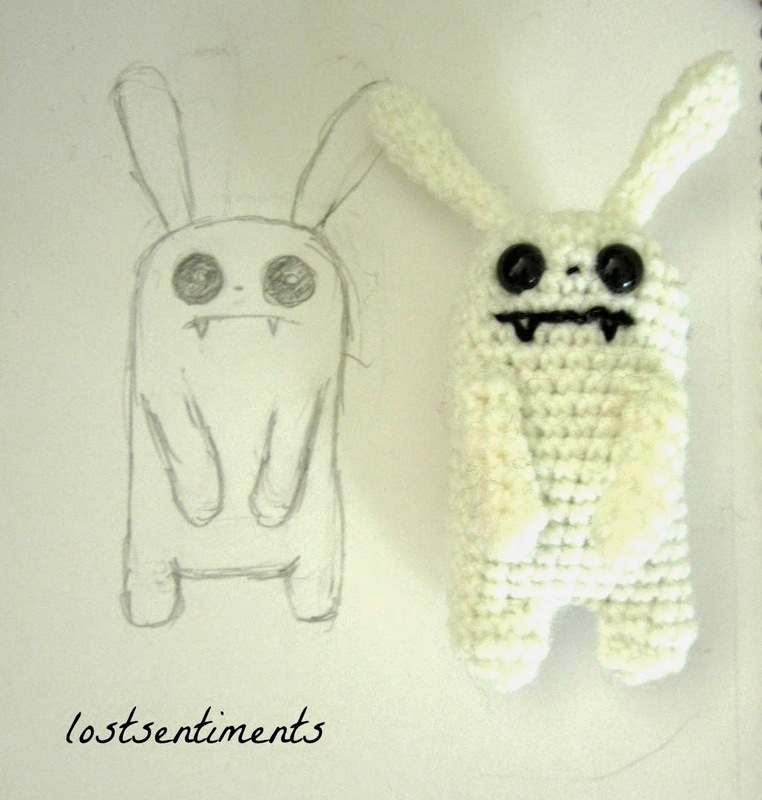 :) I have updated this post to share your blog and translation of the pattern! I plan to do the same on my facebook page as well. Thanks again! Cathedral Motif Pattern Was Popular! Thank you for following along - wherever we may go! Get emails every time I post! Who Could Forget... Mr. Bomb Omb? Dawn Pearson aka Lostsentiments TM. Simple theme. Powered by Blogger.